Japan is completing legal procedures for an ODA sum to be provided for the Vietnamese Government’s project to build new patrol ships for law enforcement forces, President of the Japanese House of Representatives Committee on Security Eto Akinori has revealed. Meeting with Deputy Defence Minister, Sen. Lieut. Gen Nguyen Chi Vinh in Hanoi on July 7, the congressman from the Liberal Democratic Party congratulated Vietnam on launching a peacekeeping centre in Hanoi and promised support through personnel training. The guest also expressed high expectation for bilateral defence ties to go deeper and more practical in line with the two countries’ strategic partnership. 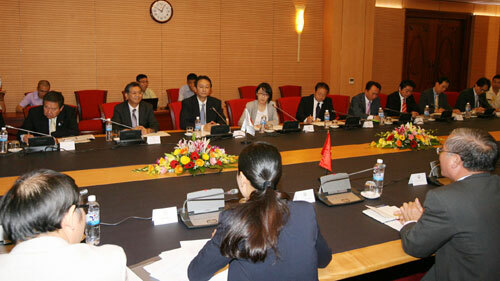 On the back of the growing defence and security links between Vietnam and Japan, Vinh suggested better joint work to realise a memorandum of understanding on bilateral defence cooperation and exchange signed in 2011. He also thanked Japan for raising voice against China’s illegal move of installing its oil rig Haiyang Shiyou – 981 in Vietnam’s continental shelf and exclusive economic zone.